The 28th Amendment Players present “A Corporate Un-Birthday Party” by Mary Klein and Steffy Reader and starring Mary Klein and Thomas Atwood. 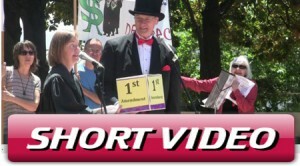 The skit was performed as part of a rally marking the anniversary of the Supreme Court’s first announcement that corporations enjoy the same Constitutional rights as natural people (1886!). Corporations are NOT people. Money is not speech. Cut corporate welfare, not social programs! Stop privatizing public property. Get corporate money out of elections. This entry was posted in Videos and tagged activism, corporate power, corporations by PPJC Admin2. Bookmark the permalink.